Back to basics tip #23: I always have a stash of snacks in my purse. That’s how I keep my kids quiet while we are running errands. But on days when we are out and about for longer than they would like or through their lunch time or nap times I pull out my secret weapon. Bubbles. I keep small bubble bottles in my purse. You know, the small bottles they give out at wedding receptions? I have one of those in my purse. Bubbles spare me that few more minutes to get out at the check out line without screaming kids. If needs to, place the bubble in a zip bag if you are concerned about it ever spilling. So next time you are at a reception where they have bubbles, grab a few extra for your purse. Or you can purchase some at a craft store where they sell wedding supplies. good idea. i never thought of that. I do that too! 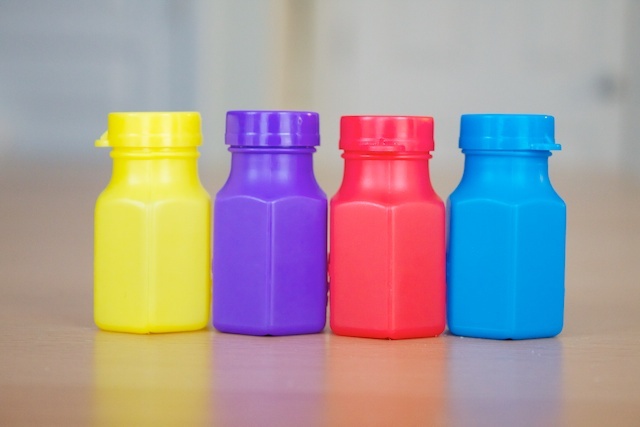 I have a stash of a few tiny bubble bottles in my purse and diaper bag. If you carry extras, you can also use them as a way to help another frazzled mom. If it seems appropriate, you can ask the mom if she’d allow you to give her child some bubbles. I’ve only done it once, and although the mom seemed surprised at first, she appreciated that the child stopped fussing and had something interesting to do. When my kids were little, I carried uninflated balloons in my purse. We would blow them up when we found ourselves in a long line or an extended wait for a dr/dentist app’t. No need to take them with us when we leave; another little had joy in a found balloon. For less than $1 a bag, quite a lot of fun in a bag of balloons. LOVE this technique! I have made 1 pattern from my daughter’s jammies and modified a simplicity pattern, by taping the 2 pattern pieces together, and made a pair of pants and a a pair of shorts. I will upload the pictures as soon as I get my hem in. I took a picture of the taped pattern pieces too. It saves so much time, it is just amazing!! Thanks for sharing this!! This comment should have been on the simple pajama pants tutorial. I don’t know what my computer is doing today. I used this when my son was younger. Once we were flying cross-country and our connecting flight was repeatedly delayed and rescheduled. I entertained a large group of kids waiting for that flight with bubbles, although with regulations now I might not bring them.